Tucked within the Treasure Valley's blossoming Southwest corridor, Fairhaven is a welcoming refuge at the end of your busy day. Its prime location at Cherry Lane and North Can-Ada Road gives you a quick commute to Boise, so you 'll spend less time in the car and more time doing what you love. Plus, you'll enjoy easy access to great shopping, dining, recreation, entertainment and more. Fairhaven is your tranquil hideaway at the heart of it all in Nampa, Idaho. Looking for Nampa new homes? 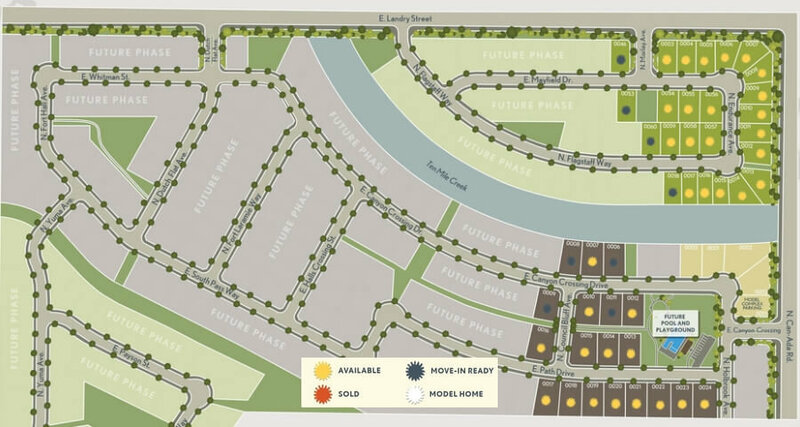 Browse our complete guide to new subdivisions in Nampa Idaho and find the perfect place to call home. From I-84 take exit 38 heading north on Idaho Center Blvd (turns into Can-Ada Rd past Cherry Ln). Turn left (west) on E Canyon Crossing - Nampa, ID 83687. Now Selling - Learn more about everything Fairhaven has to offer, contact us online or call our Nampa real estate experts at (208) 391-4466 today.